This post is sponsored by Iowa Corn. All opinions are 100%my own. 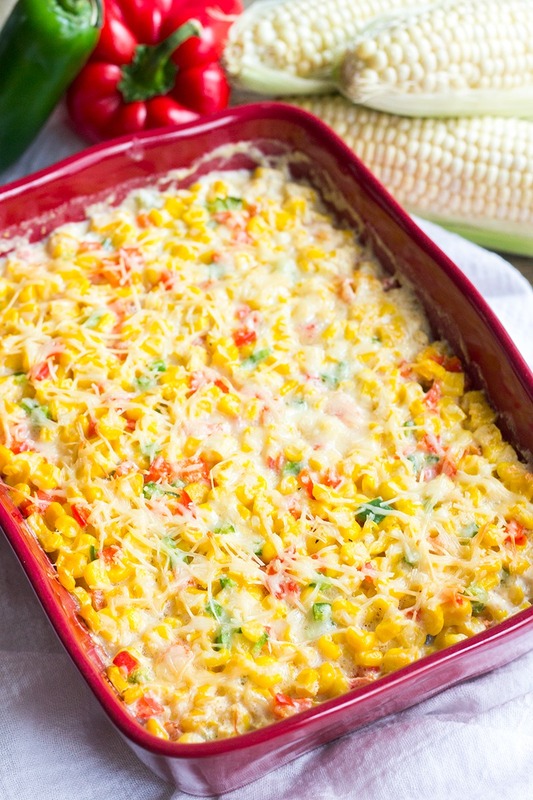 Easy side dishes like this Creamed Corn Casserole with Peppers are my favorite for busy weeknights or the holidays! 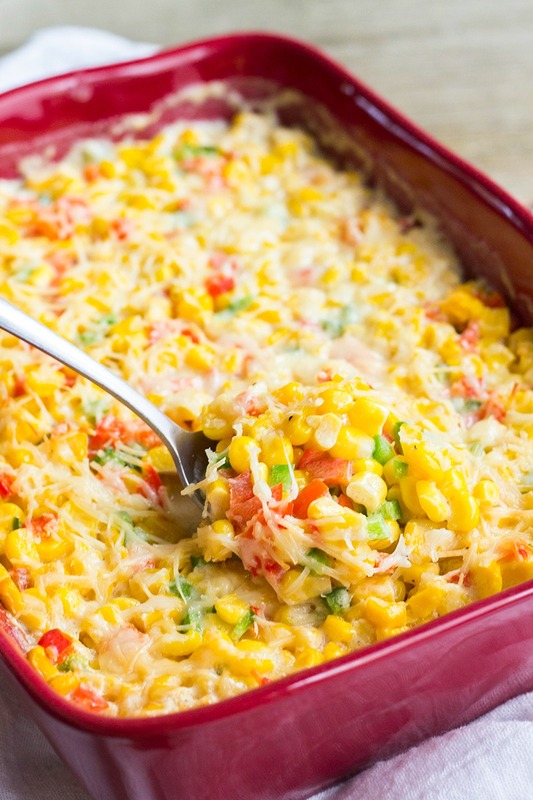 This casserole is loaded with flavor and so colorful! There’s something deliciously wonderful about homemade creamed corn. Maybe it’s the sweet corn or the creamy, buttery sauce. 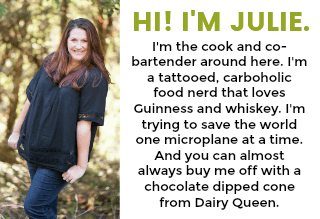 Or maybe it’s all the days I spent in the kitchen with my Southern grandma. All I know is that creamed corn casserole is one of those side dishes that lives in my heart. For this creamed corn recipe I gussied things up a bit with red bell peppers and jalapenos for a colorful and flavorful version you can’t help but love. I’ve been a corn lover ever since I was a little girl. Last month I was lucky enough to go on the #IACornQuest trip and learn more than I ever thought possible about corn. It was so amazing to learn about corn farming and meet some of the families that grow one of my favorite ingredients. 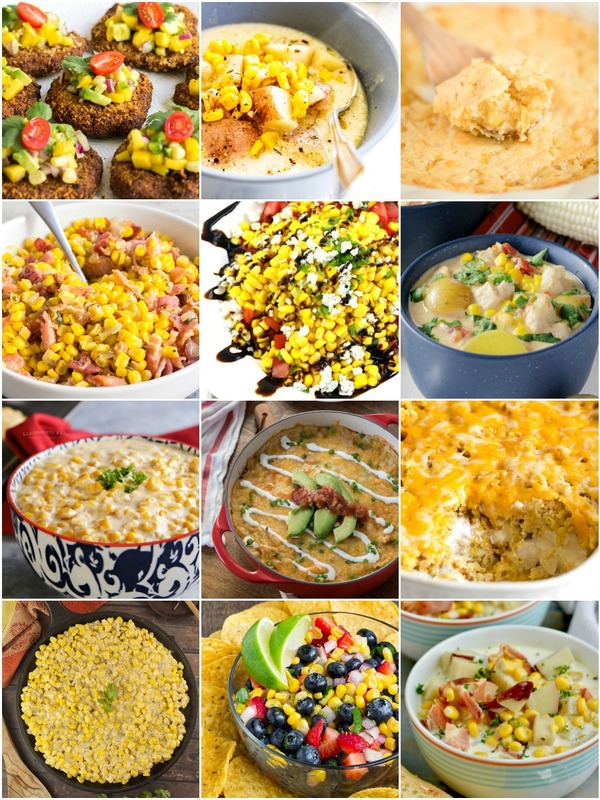 We tried all different kinds of corn-centric recipes on the trip. The corn casserole was probably my favorite of all because it took me back to Sunday suppers with the family. But creamed corn is still my go to and that’s what I’m sharing with you today! The sauce for this creamed corn casserole is on the thinner side which I love. It’s not super thick and crazy rich. There is cream cheese and butter in the sauce so you get those rich flavors, but it doesn’t coat your mouth. (That being said if you want that super creamy & rich version, try my creamed corn with bacon.) That being said, the sauce will set up a little as the casserole cools and the butter and cream sauce will marry together even more. 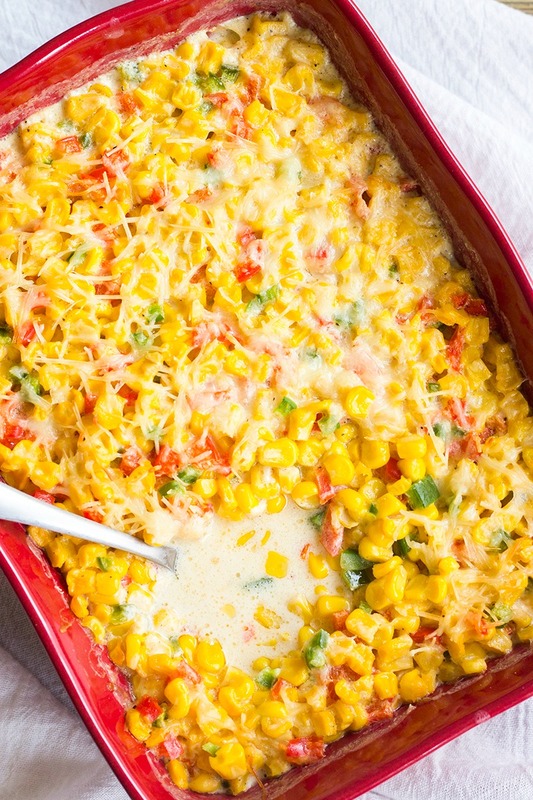 The peppers are a great contrast to the sweetness or the corn and creamy sauce. They’re bright pops that really balance out this dish. For those that don’t like spicy, you can substitute one green bell pepper for the jalapeno. Or if you want more spice, leave the jalapeno seeds in. This dish is super easy to customize to your family’s taste. 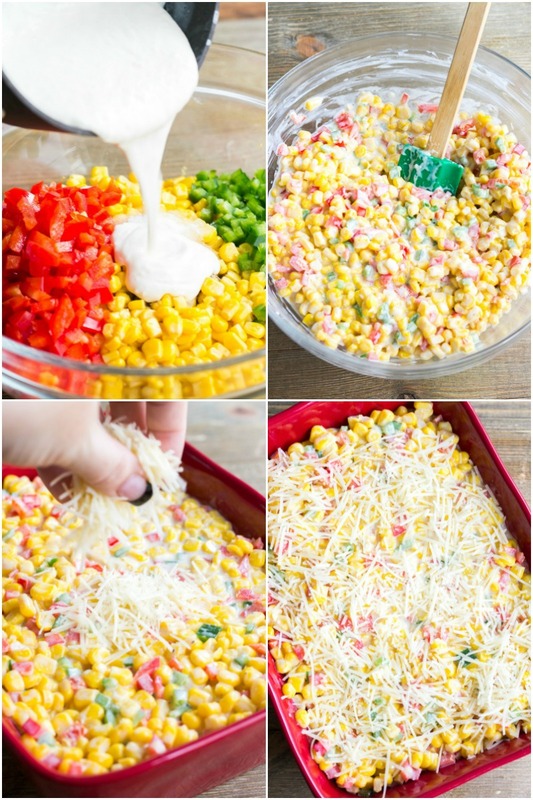 In a large mixing bowl, stir together corn, bell pepper, jalapeno, sugar, salt, and pepper. Add the cream cheese mixture and butter to the bowl. Stir until evenly combined. Transfer corn mixture to a 2-quart baking dish. Spread into an even layer. Sprinkle the top of the casserole with parmesan cheese. Bake for 40 minutes, or until the casserole is bubbling and cheese is melted. Carefully remove from the oven. Allow to sit for 5 minutes before serving. If fresh corn is in season, you can substitute 6 ears corn, shucked and boiled for 5 mins. Cool enough to handle and then cut the corn from the cob. Use as directed. 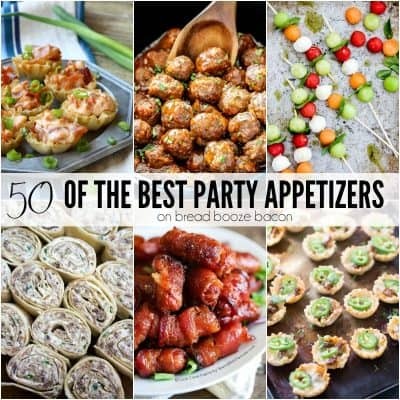 Lighten up this recipe by substituting reduced fat cream cheese or Neufchâtel cheese and 2% milk. Just looking at your dish and I can’t resist! I love colorful dish!